A: Please click here to read the terms and conditions of renting with Cascade Vacation Rentals. A: Because vacations can be disrupted for a variety of reasons including (but not limited to) emergencies, death, airline delays and disruptions, illness, and bad weather, we recommend you consider purchasing travel insurance. We offer insurance through CSA Travel Protection at 6.95% of your total reservation. It is an optional add-on and can be added to your reservation at the time of booking. A: Check-in is at 4PM check-out is 10AM. Q: How do I choose the right cabin for my stay on the North Shore? A: We have many properties to choose from, each with their own unique charm and amenities. All of our properties are listed on our website with pictures, descriptions, amenities, and other information. We encourage you to take a look to see what may be of interest, either searching by dates or by location under our Vacation Rentals tab in the top toolbar. 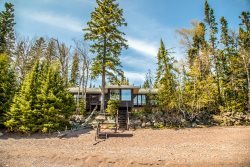 You may also narrow down your search based on what you are looking for: pet-friendly, internet, on Lake Superior, or on an inland lake. Our staff is also happy to assist you in finding the best option for your stay. We especially encourage guests with mobility issues, asthma or allergies, or other special circumstances to give us a call for assistance in finding the right spot for your time on the North Shore. A: Some of our rental homes are pet friendly (depending upon the wishes of the home owner). Pet friendly homes are clearly identified on the website, or you can choose it as a criteria in your search. There is a $75 fee per stay. Maximum number of pets allowed is 2. Q: Do I need to clean the home afterward? A: No. The reservation price includes a cleaning fee in which we will have someone clean and prepare for the next guest. However, we do ask that you leave the home ready for the cleaner, such as cleaning up after a pet, removing garbage, loading and running dishwasher, etc. Q: What is provided? Do I need to bring linens? A: No. All homes are furnished with bed, bath, and kitchen linens. Kitchen amenities such as pots, pans, knives, etc. are also provided at properties with kitchens. Basic household products such as trash bags, paper towels, and toilet paper, plus dish, laundry (if applies) and bar soap will be provided. Due to health code, we cannot provide any food or seasoning items, even salt and pepper. Please bring these for your stay if you need them. Most other amenities are listed with the property description. A: Our office is located in Lutsen at 5335 West Highway 61. Q: Will I have cell phone service up there? A: If your carrier is Verizon, you will have cell phone service along most of Highway 61 up to Grand Marais and a little bit inland. Service for other carriers is spotty at best. Q: Do you own all of these homes? A: No, Cascade Vacation Rentals simply manages the rentals and maintenance of these homes. The home owners usually live elsewhere and rent out these second homes. The rental homes are usually well-loved family retreats. Many have been in the family for generations and have unique architecture and history. The rental binder in the home will often provide these details. Q: Can I buy a gift certificate for a friend or family member? I want to mark a special occasion. A: Yes! We offer customizable gift certificates that can be for a dollar value or a specific stay. A gift certificate is a great idea for birthdays, weddings/honeymoons, baby showers/babymoons, retirements, graduations, holidays, and more. Whether they are a long-time guest or new to vacation rentals, there is no better gift than time away on the North Shore. Please contact our office for more information or to purchase a gift certificate. Q: We are coming up for an event (such as a wedding) on the North Shore. Should we bring our own iron, ironing board, and hair dryer? A: Yes, please do bring them with you if you need them. Many of our homes are not equipped with these items. A: We don't have one home that will fit more than 14, but we do have many options for family reunions. Many of our rental homes and condos are located very close together. Your party can reserve a few and use one as the central gathering place. This is a huge improvement over using a hotel lounge as the central gathering place, and you can cook together, too! Q: Why should I choose a vacation rental home over a hotel? Tons of Space: Whether you are traveling with two, four, or 14, you want to enjoy your vacation on your own terms. With multiple bedrooms and bathrooms and at least one central gathering place, vacation rentals offer the right space for every size group. Forget the hassle of trying to coordinate hotel rooms for a big group. Pure Privacy: A vacation rental home offers privacy from the big crowds and close quarters at hotels. You and your family have the place to yourselves. Budget: Vacation rentals are cost efficient, particularly for groups of four or more. You'll save hundreds over the course of a week by skipping restaurant meals alone. Unique Homes and Spectacular Views: Vacation homes are well-loved family retreats, often with interesting history, architecture, furnishings, and more. Plus, many are right on the water, with access to views that would cost a premium at hotels. Pet Friendly: Many homes are pet-friendly. You save on kennel bills while hanging out with your best four-legged friends. Pets deserve a vacation, too. Q: What is this "extra person fee"? A: Extra guest fees compensate for additional utility and cleaning fees and allow rates to directly reflect usage. This makes homes more affordable for smaller parties.